WTF? (for picks). Part of my collection of commonly used gambar for fanpop picks.. Images in the fanpop club tagged: picks. 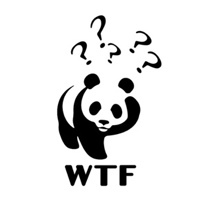 I only just realized that this is a doctored WWF logo. Very funny!